What Makes Katz & Dogs Different? When making a decision about which animal hospital to use it can be tough to decide. So many things look the same. Here are just few of the things that make us different. All appointments are scheduled for one-half hour, compared with a “standard” 10-15 minutes at other hospitals. This gives plenty of time for you to tell us about any concerns you have with your pet, for Dr. Katz to perform a thorough exam, to address any needed care and to answer any questions you may have. Every technician team member at Katz & Dogs is a graduate of an AVMA approved veterinary technology program and has passed their national licensing exam. Schooling and licensing is not required in New Jersey and most animal hospitals use on the job trained technicians. We welcome and encourage anyone interested in touring our entire facility to call to make an appointment to do so. Each time you and your pet visit Katz &Dogs, you will always receive a follow up call from one of our team members the next day. We want to be certain your pet is doing well and to make sure we are available to answer any further questions you may have. We highly encourage owners to bring their pets in anytime for a cookie and a kiss! A visit to the vet need not be a negative experience. This positive reinforcement helps young pups and even mature adults look forward to their office visits. Designed with your pet in in mind, our front exam room has large storefront windows so that our patients can look out during their exam and not be stressed by the confines of a small space. It also features a quiet lift table for our larger patients. We also have two exam rooms that were created to be more comforting to smaller dogs and cats. It allows them to be examined while not feeling overwhelmed by an overly large area. Katz & Dogs is one of a few hospitals in New Jersey which meets the standards of the American Association of Feline Practitioners to be certified as a “Cat Friendly Practice”. 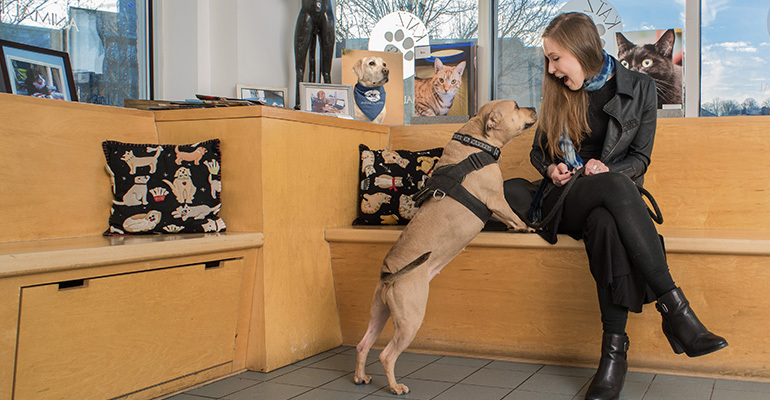 There are many criteria used to obtain this certification including, but not limited to, separate waiting areas for cats and dogs, feline specific continuing education requirements and separate hospitalization areas for cats and dogs.